One of the very first and certainly one of the most influential country rock groups, The Flying Burrito Brothers were destined to make great music from the off when one considers their line-up. Although the recently departed Byrd, Gram Parsons tends to garner the most critical plaudits for his role as songwriter, rhythm guitarist and lead singer, the other Burritos weren’t too shabby either. Chris Hillman was, like Gram, an original member of The Byrds, as was the eventual drummer, the implausibly good-looking Michael Clarke. Added to their ranks were the pedal steel guitar virtuoso Sneaky Pete Kleinow and the bass playing hub of the group, the underrated Chris Ethridge. 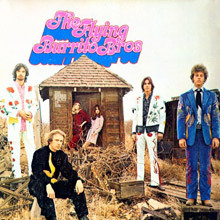 To that extent this ensemble who recorded the second album, Burrito Deluxe, was a super group affair and in future years players of the calibre of Bernie Leadon (The Eagles), the fiddle maestro Byron Berline, guitarist Al Perkins, Skip Battin and Gene Parsons (no relation of Gram) would bolster the ranks. Their legacy is to have become an icon of the country rock style – both in its sound and its excesses. They were feted by The Rolling Stones and regarded as equals by The Eagles and Crosby, Stills, Nash and Young and in retrospect their albums – from The Gilded Palace of Sin onwards – set a high-water mark for the genre. In later years, the flame lit by Gram Parsons, who died in mysterious circumstances and was initially buried in the Joshua Tree desert, was kept burning by his one-time lover Emmylou Harris: thanks in part to her, the Burritos blend of country, rock and roll and southern soul remains a template for generations of aspiring Americana artists. Various alternative country acts and a surprisingly large number of traditional Nashville folks owe them more than lip service. Their fans include Evan Dando (Lemonheads), Wilco, Travis Tritt, Vince Gill and The Jayhawks. It’s arguable that the entire Paisley Underground scene wouldn’t have happened without them and in Britain they are frequently name-checked by the sharp end of the new wave – Elvis Costello is a huge supporter. But in truth they are so idiosyncratic that they are almost impossible to emulate. At loggerheads with his fellow Byrds, particularly Roger McGuinn, Gram Parsons quit that band in late 1968 after making a maximum contribution to the classic Sweetheart of the Rodeo album. Seeking to return to the styles of his earlier outfit, The International Submarine Band, Parsons recruited Chris Hillman and the two men set about recording a batch of songs at a rented house – jokily named Burrito Manor – in the San Fernando Valley. Sneaky Pete and Chris Ethridge were the hired hands that hung around for the duration and enriched the sound with their skills, while two drummers were enlisted to record The Gilded Palace of Sin (1969). Jon Corneal and Eddie Hoh were respected session men, the latter having played with Donovan and accompanied The Mamas and The Papas at the Monterey Pop Festival. None of this mattered a lot to Parson, however and together with his trusted friend Hillman, he masterminded a set of songs that have since become certified classics even if the album itself has yet to go gold. That’s remarkable considering the quality of ‘Christine’s Tune’, ‘Wheels’, ‘My Uncle’ and ‘Hippie Boy’. Addressing political and social matters with a wry, hands-off apolitical view, Parsons revealed himself to be far more interested in the nuts and bolts of ‘authentic’ American country – what would later be termed by him as Cosmic American Music: namely, a melting pot of country, folk, R&B and beyond. Dressed in suits from the LA cowboy tailor Mr Nudie and surrounded by dangerous looking blondes, the Flying Burrito Brothers had the air of a gang of gamblers and high rollers and they certainly helped to put the decadent side of California back on the map with a vigour unseen since the golden age of Hollywood. 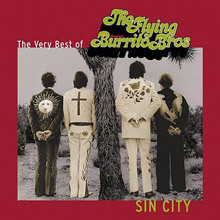 This is such a strong album that we recommend you discover it with the follow-up, Burrito Deluxe, which we offer as a double set and in expanded form as Sin City: The Very Best of the Flying Burrito Brothers. This is an absolute must-have. The subsequent disc, originally released in 1970, is actually the last album to feature Gram, who was sacked from his own group! Before he left he had the sense to hire Michael Clarke from the Dillard and Clark operation, then guitarist Bernie Leadon arrived from the same ensemble bearing a variety of guitars and banjos. As a result of all the changes, Hillman moved from rhythm to bass when Ethridge departed during sessions for Burrito Deluxe - but even given the fragmentary nature of the band’s career, they still turned over another gem. Parsons’ new pal Keith Richards gifted him an early attempt on the Rolling Stones’ ‘Wild Horses’ (much to Mick Jagger’s evident annoyance) while Leadon reactivated the outfit’s song writing bug by chipping in for country masterpieces like ‘Older Guys’, ‘Cody Cody’ and ‘Man in the Fog’. Adding a sublime version of Bob Dylan’s ‘If You Gotta Go” was a masterstroke and several specialist players – Byron Berline, Leon Russell, Tommy Johnson and Buddy Childers – enhance the sound from country to honky tonk and a variation of horn led fusion. It’s an extraordinary achievement. Although they continued with most of the original line-up on The Flying Burrito Brothers and Last of the Red Hot Burritos (an apt title in the circumstances) and as excellent as these albums are, the passion, flair and charisma of Gram Parsons couldn’t be replicated. The blue eyed boy from Winter Haven, Florida embarked on a short and stratospheric solo career that gave us G.P. and Grievous Angel (his posthumous nickname) and he died in 1973 aged 26 – even younger than the norm for rock stars who burn too bright. His was undoubtedly a tragic loss since his Cosmic American Music had so far left to run. He deserves all his accolades as one of the most influential recording artists of all time, but he could and should have risen far higher had he stuck around and not fallen foul of recreational drug abuse. 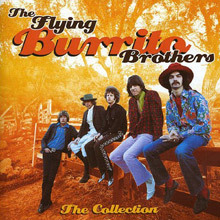 Meanwhile, it is still a pleasure and a thrill to listen to The Flying Burrito Brothers today and we have no hesitation in pointing you towards other items at hand. In terms of compilations and anthologies we have Out of the Blue, a 2-CD and 42 track set that contains all of The Gilded Palace of Sin, most of Burrito Deluxe and several rarities, including the live takes on ‘Wake Up Little Susie’ and ‘Money Honey’, that showcase Hillman’s vocal brilliance and Al Perkins’ lead guitar work. The re-mastered sound quality on this set is also staggering. The Collection is a fine primer with a slew of vital and definitive songs – try the Dan Penn and Chips Moman soul scorcher ‘Dark End of the Street’ – while Sleepless Nights (the original title for Grievous Angel) combines Gram Parsons material and Burritos standards, This is particularly of interest since it features the toughest C&W interpretation of ‘Honky Tonk Women’, the spiritual deconstruction of the Louvin Brothers’ ‘The Angels Rejoiced At Dawn’ (beautifully carried home by Emmylou Harris), two further duets with Harris and a host of pure country items that Harris discovered in the Burritos vault. The Flying Burrito Brothers as a band and Gram Parsons as a member of that outfit - and as a solo artist - still command enormous respect but it’s their music we love and the part they played in moving American country and folk along from a rather staid position in Nashville to a nationwide phenomenon that paid homage to the roots while modernising the look, the sound and the ethos of what became Americana. Start here for the deluxe version. You can’t go wrong. The Gilded Palace of Sin is the first album by the country rock group The Flying Burrito Brothers, released in 1969. It continuedGram Parsons' and Chris Hillman's work in modern country music, fusing traditional sources like folk and country with other forms of popular music like gospel, soul, and rock & roll. The Gilded Palace of Sin is listed at number 192 in Rolling Stone magazine's 500 Greatest Albums of All Time. 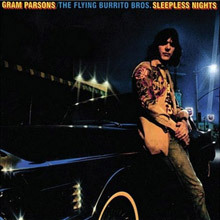 leepless Nights is a posthumous compilation album by Gram Parsons. There are no original Parsons songs on this album; the majority are vintage country songs with the exception of "Honky Tonk Women" by Jagger/Richards. Some of the highest praise for the album is due to the inclusion of three tracks featuring Emmylou Harris and omitted from the 1973 album Grievous Angel; "Sleepless Nights" (allegedly the original title for the Grievous Angel album), "The Angels Rejoiced in Heaven Last Night" and "Brand New Heartache". 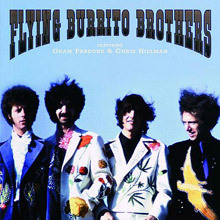 The majority of the tracks are from a much earlier period and recorded during Parsons's time withThe Flying Burrito Brothers, shortly before his exit from the group. Compilation album containing songs from the first three Burritos albums, plus several unreleased tracks. Best of compilation released in 2002.